“"This is a fantastic retreat venue - in acres of beautiful countryside. The converted barn works as a delightful yoga studio with its underfloor heating. The hosts were wonderful - we were totally up for the tree hugging! Leaving feeling spoiled here with a 5* experience." Fabulous luxury under floor heated quirky wash house centrally located for use by all site guests. Clean boating lake from the waters of the cleanest chalk stream in the UK, the River Nar, is central and easily accessible, available for swimming in too. The outdoor swimming pool is available for the cottage guests only, just in the summer months. Superb central outdoor communal kitchen area complete with all amenities you’d expect plus a pizza oven. The communal fire pit area is really popular for gathering to make friends, watch the stars, or toast marshmallows. 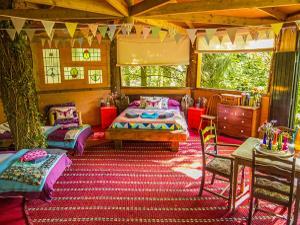 Each unit has its own BBQ – gas for tree houses and small charcoal ones for the bell tents. Children welcome from any age.